Campaign tactics by Democratic officials to ensure the party retakes control of the House this fall have sparked complaints from some candidates about the interference and led to growing concerns the heavy-handed moves could backfire. 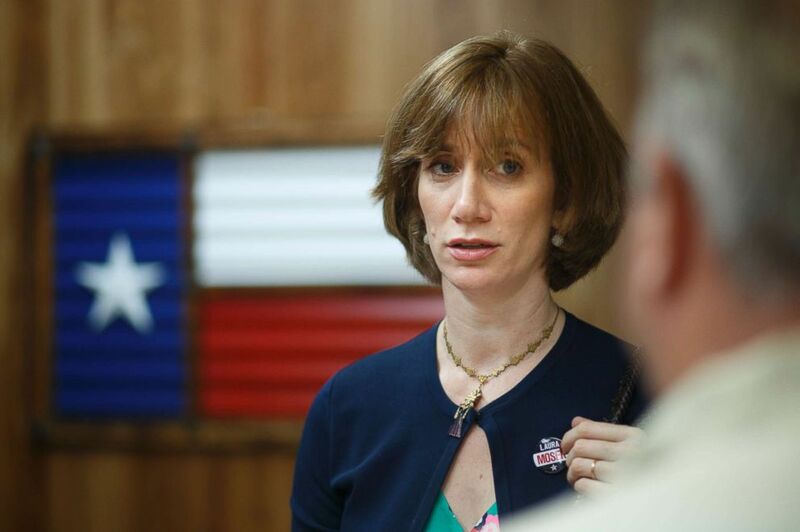 The dynamic was dramatically apparent in Tuesday’s Texas’ 7th Congressional District primary — where an acrimonious showdown garnered national attention after the Democratic Congressional Campaign Committee (DCCC) published opposition research on Democratic candidate Laura Moser. But a similar pattern is emerging in several key House races throughout the country – contests the party needs to win to help them flip the 24 seats necessary to retake control of the House of Representatives. There is intense pressure on the DCCC and local party officials to ensure a Democratic victory. Laura Moser picking up her campaign materials at a print shop in Houston, Texa, May 22, 2017. Moser is running for the 7th Congressional District in Texas currently occupied by Republican John Culberson. “Every DCCC chair has to make a decision based on winning. Not ideological purity but winning,” a Democratic official with knowledge of campaign tactics told ABC News. "Parties often try to interfere in primaries because they want to control the playing field,” said Julian Zelizer, a history and public affairs professor at Princeton University. Part of the organization's interference during this year's midterm elections is due to the sizable number of candidates running for office – a record number of them new to politics. 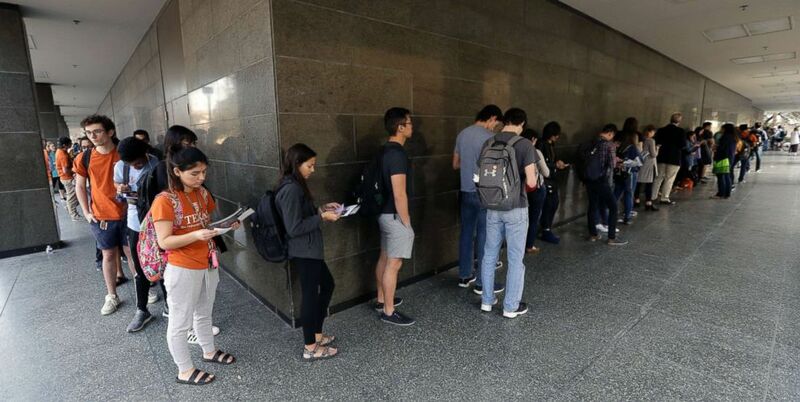 A line of students wait to vote at a Texas primary election polling site on the University of Texas campus in Austin, Texas, March 6, 2018. Some officials and operatives worry that this could mean that the candidate that makes it through the primary may not be the strongest one they think can win in the general election. The candidates being pushed are pushing back, however, using the party’s moves to frame a narrative that they are outsiders running against establishment picks. They also claim voters will react badly to the perception the party is telling them who to vote for — in the Texas contest, Moser made it to the runoff despite the party’s actions against her. Division isn’t new to the Democratic Party. In her book "Hacks: The Inside Story of the Break-ins and Breakdowns that put Donald Trump in the White House", Donna Brazile explored the ways in which the Democratic National Committee favored former Secretary of State Hillary Clinton, seen as symbol of the establishment, over Sen. Bernie Sanders, a symbol of the party’s more progressive wing, in the presidential primary. While DCCC’s action in Texas 7th Congressional District has been the most drastic attempt to funnel voters toward a party-backed candidate, it’s far from the only action to clear the field in other races. In the race for Pennsylvania’s 7th Congressional District, Greg Edwards’ campaign told ABC News the DCCC tried to push him out of the race by approaching local Democrats to ask whether he could be persuaded to seek state office. Dan Friedman, a spokesman for Edwards, claims the DCCC acknowledged to the campaign that it had explored that option. 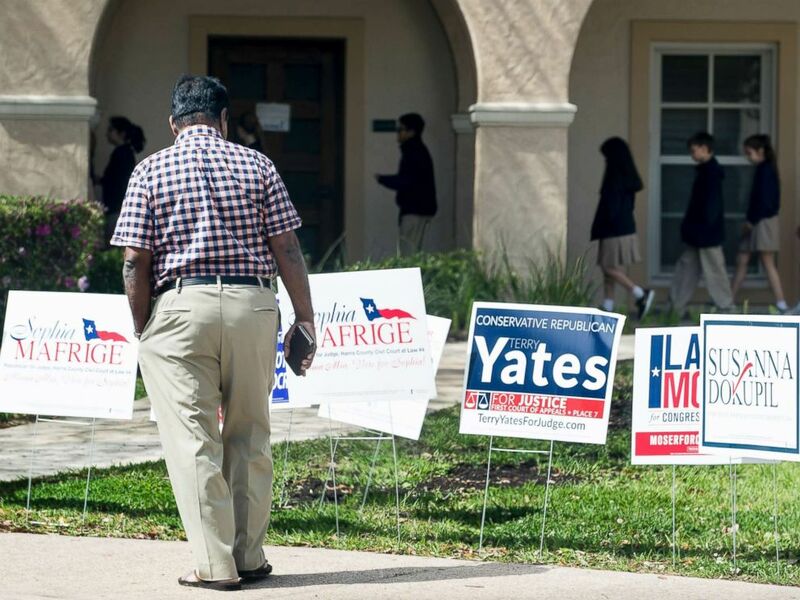 A voter stops to look at primary election signs outside the polling place at St. Anne's Catholic Church on Tuesday, March 6, 2018, in Houston. “There is a fundamental disagreement with the establishment of the Democratic Party and the candidates who are more progressive in their vision about what the vision of the party is and how to go about winning,” Friedman told ABC News. The DCCC doesn’t deny Edward’s claims. An official there said the creation of 18 new districts in Pennsylvania just weeks before the primary resulted in them asking several candidates if they might run for offices further down the ballot. Candidates in other races describe similar tactics. In Kentucky’s 6th Congressional District, Democrat Amy McGrath claims the DCCC recruited Lexington Mayor Jim Gray to run in the party primary. The district is heavily Republican, and Vice President Mike Pence campaigned for incumbent Rep. Andrew Barr, R-Kentucky. McGrath, a former Marine pilot, sees a chance for progressive Democrats to win if they’re allowed to campaign, telling ABC News “Powerhouse Politics” podcast the district’s vote for Trump in 2016 wasn’t a vote for the political establishment but a rejection of it. Gray’s campaign told a local paper he decided to run after getting calls from friends and family in the district, not the DCCC. The race for California’s 39th Congressional District, California Republican Rep. Ed Royce’s open seat has prompted an army of candidates to run. California has a top-two primary system, where the two candidates with the most votes regardless of party will move to the general election. There are concerns the high number of Democratic candidates will split the votes so broadly among all them that two Republicans would end up making the ballot. “Working alongside grassroots activists and the California Democratic Party, the DCCC is keeping all options on the table to ensure that voters have a Democrat on the ballot this November,” a DCCC spokesman told ABC News. At least one progressive campaign complains about interference. Asia Cunningham, campaign manager for Mai Kahn Tran, a local pediatrician who has gotten endorsements from influential groups such as Emily’s List, says “establishment” officials are “aggressively working to push us out.” She claimed the DCCC presented them with fundraising numbers to prompt them to exit the race. “On one side they encourage all women to run and to speak up, and on the other side they prefer self-funded millionaires over any women [in the race],” Cunningham told ABC News. In Washington State’s 8th Congressional District, seven Democratic candidates are vying to replace retiring Rep. Dave Reichert, R-Wash. The district is another one won by Clinton and a top pickup opportunity for Democrats. But several former and current candidates told ABC News state party officials are putting their thumb on the scale to determine the outcome of the election – favoring Democratic frontrunner Kim Schrier and working to discourage others from running or staying in the race. Chris Franco ran as a Democrat in the district before withdrawing earlier this year. None of the Democratic candidates in the race have campaigned for or held office. A candidate currently in the race has similar complaints about the party. She said the party has told candidates they’d be looking at their fundraising filings every quarter but has not discouraged anyone from running.